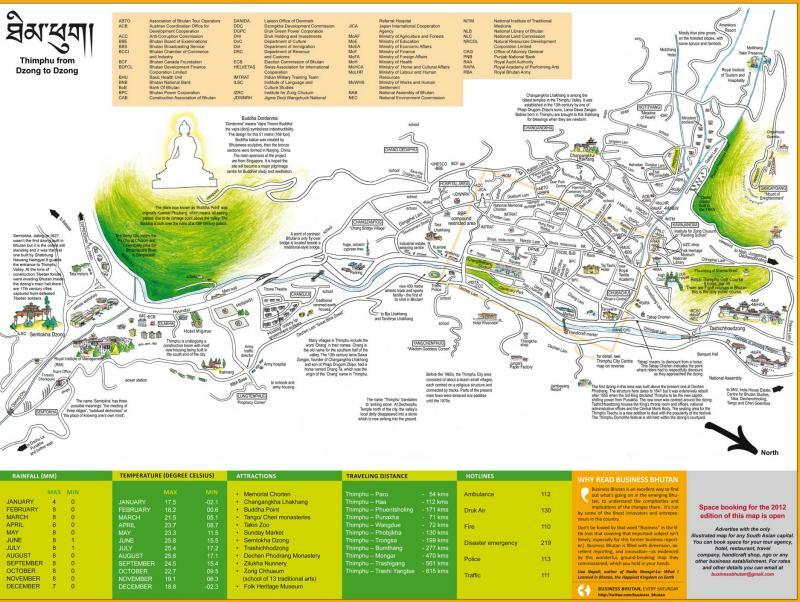 green tea: The Thimphu Map is Published At Last! 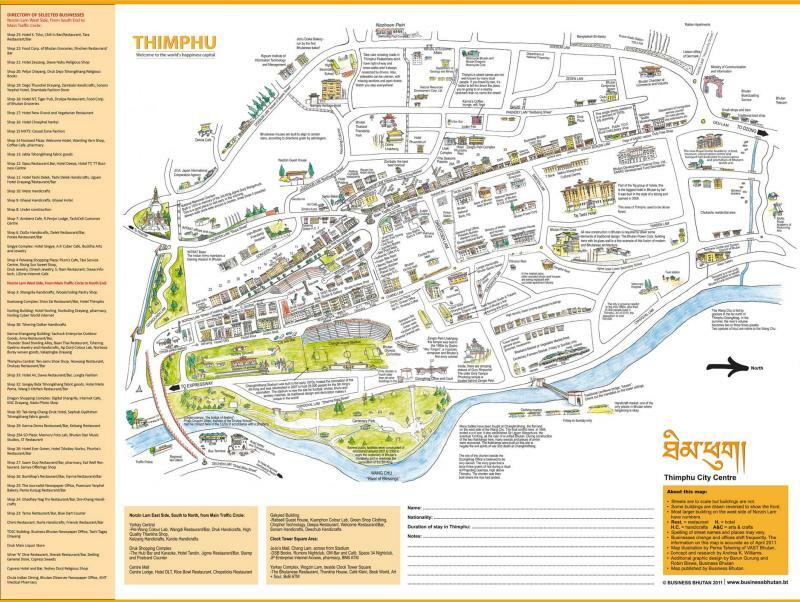 The Thimphu Map is Published At Last! I thought it might never happen. So many months had passed since I’d heard any info that I suspected the whole thing may have been abandoned. But, the good news reached me last week. My Thimphu map has been printed by Business Bhutan and it is now officially for sale! The thought of making a tourism map for Thimphu came to me in November 2009 and now, as of October 2011, the map is a reality. So far, the map is available at the stamp shop at the main post office in Thimphu, at the Paro Airport post office and various souvenir and book stores in Thimphu. I'll update when more vendors are confirmed. Visitors to Bhutan, you can navigate the town with the map, use it to understand your destination and find what you need there, take it home as a souvenir, show it to friends, tack it to the wall of your study, refer to it when trying to sort out what you took photos of during your city exploration. Locals, you can also enjoy the map for its artwork, pin it up in your shop or office as decoration, look at the different landmarks with your kids, marvel how many things have changed so quickly in the town. Because I am somewhat of a perfectionist when it comes to certain things, I couldn’t help but notice what I would have liked to change or improve on the map now that I’ve seen the result. My visa length was insufficient so I had to leave the country long before the final version was sent to print: I was not able to have a last look-over of the image. There are a few small corrections, mostly to do with the positioning of the text and arrows on the maps. The maps had been hand drawn at full size by artist Pema Tshering (aka Tintin Dorjee). I first saw his skillful and charming work on the banner of the Bhutan Backstage website. I drew detailed draft maps and Pema re-drew them in his style. I intended to scan Pema's original maps and then add my labels and text to the digital file in Adobe Illustrator. I soon discovered that there was no functioning scanner in Thimphu (or possibly Bhutan) larger than A4 (letter-size) paper. I went absolutely everywhere looking for a larger scanner, from the biggest newspaper office to graphics production shops to The Department of Geology and Mines. No luck. I had to scan the maps in eight panels each and then stitch the images together to get the full map. Of course, the eight panels did not match perfectly or at the exact same angles. I did my best considering the resources at hand. I added my text as separate layers of the Illustrator file. After I left, someone eventually took the maps by plane to Bangkok where they were scanned as a single sheet. Then, the graphics staff placed my layers of text over the new high quality scans. The problem is that the hundreds of little pieces of text were aligned to the images on my stitched-together map scans, not the good scan. Everything was shifted over just a little so in some places, the text overlays a street or over a building or it is slightly removed from the thing it is describing. It is just not as clear as it would have been had I been able to spend more time with the digital file. There is also the problem that there are many businesses in town that have closed, moved or opened since I did my research. Also, I forgot to add elevation points. Oops. These are all things to keep in mind for the next, improved edition of the map! Despite the disappointment of discovering minor errors on the finished product, I am so happy to see the final look of the maps. I have created exactly the kind of information I would have loved to get when I first visited Thimphu as a tourist. The image above is the cover flap of the map and it features the illustration of Semtokha Dzong, the fortress which stands guard at the entrance to Thimphu Valley. The title "Welcome to the World's Happiness Capital" was not my idea but I like the optimistic tone. It refers to Bhutan's now famous 'Gross National Happiness' concept. Although I have not received an actual printed copy yet, I can tell you the map itself is double-sided, 36" wide and about 20" high, full colour. The front of the map shows Thimphu's city centre, including Norzin Lam (the main street), Changlimithang Stadium, the Wang Chu (river) and the National Memorial Chorten. The flip side of the map shows the wider valley, starting from Semtokha Dzong in the south and reaching to Tashichhoedzong in the north, with "Buddha Point" and Sangaygang to the west and the east bank hotels, also. Voila! I am now a published map maker! I do have more ideas for maps of other parts of Bhutan, and an idea for a tourism guide book. Tourism authorities or publishers can get in touch with me if this would be of interest. Nice! good to know that such a map is available now. Yay!! That's so exciting - congratulations! It looks really, really, really great. Congratulations! That's a great accomplishment! Congratulation!!! It must be so awesome to see all your hard work in print now. New edition? Does that mean you'll be going back soon? You worked so hard on this so I know the perfectionist in you is reeling over a few little things but seriously, it looks wonderful! Congrats on a great job! A properly detailed map of Thimphu City is a useful reference material to have. I will take a look and buy few copies for my visiting friends. Hey congratulations! It's definitely great to see one's hard work realized. Always great to read your blog. Great idea and good work! I LOVE maps of this type! Wish it was available when we where there.